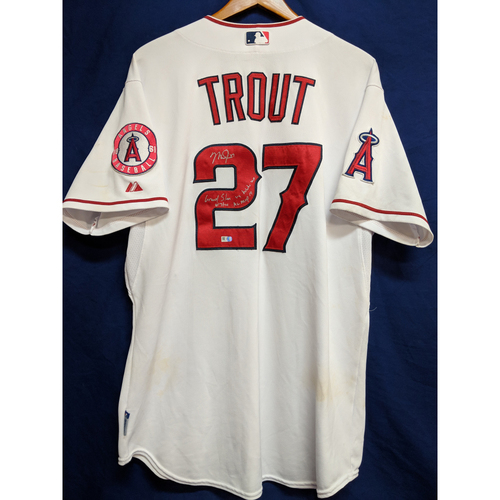 This jersey was custom made for Los Angeles Angels Center Fielder, 2012 American League Rookie of the Year, and 2 time American League Most Valuable Player Mike Trout for the 2014 Angel Season home games. This Jersey was worn on June 7th 2014 when The Angels hosted the Chicago White Sox. During this game Mike Trout would hit his 12th homerun of the season, an Eighth inning Grand Slam off of Chris Sale. This would be a large part of a 6 run 8th inning that would give the Angels the lead and the victory. 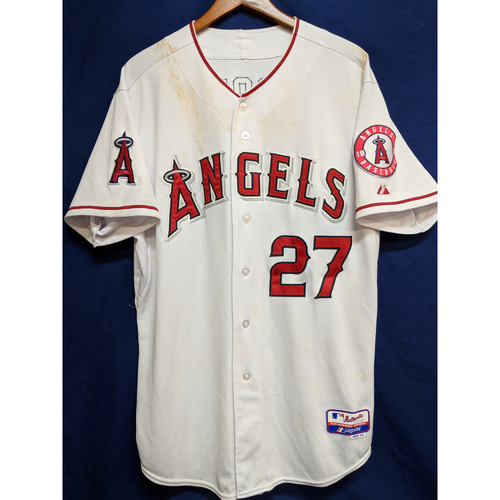 This Jersey is a size 48 and was signed on May 8th 2018, the inscription reads "Grand Slam vs White Sox 6/7/14 AL MVP.